Pretty cool stuff! I bet it feels good to have the trio. The world coin posts, in general, are pretty slow so I can not say it is surprising that you were the last post twice in a row. I have a bunch of new additions but I have not had the time to take decent pictures. Here are some of the recent additions that I did manage to photograph. Wow, those are pretty interesting! This is the first time I’ve seen anything like it. The one on the right is particularly eye catching. Thanks for sharing! I agree this guy is beyond help. Where do these people come from? The funniest part about it is that it would literally be no trouble at all to build one of these sets in the exact same holder with the 1885 O Morgan dollar. We literally had dozens of these exact same holders (some with 1885 O Morgans) laying around when silver last skyrocketed. I should see if we still have the empty holders. Maybe he would like to add some more to his “unique” collection. Mohawk (Tom? ), I will do my best to lend a helping hand so you do not have to go at this one alone. It appears he believes he also has a branch mint proof Morgan. Mason254, although your coins appear to be uncirculated they are not SMS coins. The Morgan dollar is not a branch mint proof. This set is not unique nor is it rare. It was likely a marketing ploy to trick uneducated people into paying exorbitant prices for average coins. Sets like these are common and beyond the Morgan dollar would most likely be sold for the silver content. As proof, here is an example just like yours with a different date/mintmark Morgan dollar in it. Are you asking if you can mail two different submissions to NGC in the same box? You can, without doubt, send multiple submission in the same box. You can even request the submissions be sent back together when they are both complete to save in shipping costs. The only downside to asking them to be shipped together is that your grades will not be available until the slowest order is completed. So if your raw dollars take 20 days and your GSA takes 35 days, you wouldn’t see your grades for the raw coins until after the GSA was completed. There is no minimum required for most submission tiers. If you navigate to the NGC website and click on the submit tab there is an option to view all services and fees. This is where you find out if a minimum submission requirement applies. What do you guys think about this Toning? I agree with Bob. None of those look natural to me. I also think that #2 and #5 look cleaned which might explain the color. This is a damaged half dollar. It was not struck on a clad planchet. There are no additional mint marks. You have not discovered a rare error coin to add alongside your nonexistent “mint branch proof” Morgan. If you feel you know more than those on these boards with decades of experience and accumulated knowledge then submit it to NGC. Although, according to you in an earlier thread about your polished Morgan, you also do not trust NGC which is one of the most trusted companies in the hobby. I suppose you’ll just have to establish your own grading company. If I had to guess I likely picked this thing up when I was maybe 15? Now with over a decade of additional experience, I would not take a second glance at it. I did not have a code on the flip so I can’t say for sure, but given my age, I doubt I paid much of anything for it. I am sure I had other more deserving coins that needed to be graded at the time. A lesson well learned. 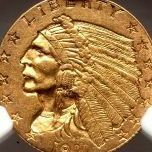 Here is a coin I submitted a long time ago when I was substantially more naive about the intricacies of counterfeit coins. I do not recall where I got it from or I would list the source. The coin by all appearances seems to be silver, but I never had it tested. The first indications that it is counterfeit are the weight (30.55 grams) and diameter (40.43 mm). The weight should be 26.8 grams and it should have a diameter of 39 millimeters. The second indication is the lack of detail. According to NGC, this is the 7th most counterfeited Chinese coin (https://www.ngccoin.com/resources/counterfeit-detection/top/chinese/7/). This is far removed from my area of focus, so I do not have anything intelligent to add. JKK is very knowledgeable and brings up some pretty good points. However, it should be pointed out that if the place you are having the coin tested is using a stone and acid be sure to have them scrape the edge and not either face of the coin. Should it turn out to be genuine, the damage to either face could impact the value. Before putting them in your change may I make a suggestion? You could find a YN in your local coin club to give them to. It may be the push a kid needs to start a Lincoln set and despite the AT they are decent quality coins to start off with. I know I would have been ecstatic if I was given these when I was a kid. Nice addition! I usually do not look at ancient coins but I can only imagine a nicely toned example really pops in hand. Thanks for the positive responses! Heritage has quickly become one of my go-to places to do research on past auction prices. They really do have an impressive archive. It also helps put into perspective how rare certain pieces are in relation to others. Peck is a great resource, but I have realized that certain pieces he has marked as “scarce” are actually much harder to come by than pieces marked “extremely rare”. Of course, there are a lot of factors to consider, but it is nice to have such a well-documented and easily searchable archive at my disposal. Great question! I am honestly not sure. I usually do not collect errors so I do not know how they would determine that. I am sure some of the more knowledgeable people like Conder101 will be able to provide an answer (I wish there was a way to tag people in posts so it would bring their attention to it). I see where you were going with the edge lettering, but this coin has a plain edge. This may be something I can research a bit further. I have an account with Great Collections, and I check it regularly. I have heard so many great things about them from both the buying and the selling perspective. I am eager to give them a try, but they usually do not have the type of material that I am looking for. If I still collected US coins, I would likely purchase quite a bit from them as they have a decent selection. Today has been an awesome day! It started with an email notifying me that one of my most recent manuscripts had been accepted for publication in its current form. This was super exciting because it meant that I only needed to double check the typeset proofs sent by the editor and sign the contract before it could be published. Plus, it is always nice to know that my colleagues find enough value in my line of research to justify the publication of my findings. Although that alone would have been plenty to be excited about, another little treat came soon after I got home. My first purchase from Heritage came in! Up to this point most of my purchases were from online stores and eBay. This was my first attempt to purchase anything from a large auction house. I found a few coins that I liked and placed bids that would allow me to stay within my budget, but this was the coin I wanted the most and I bid accordingly. The live bidding portion of the auction unfortunately occurred when my wife and I were making the 3-hour drive back home through an area with virtually no cell service, so I was unable to check the live updates. I was anxious to see how I did on the 5 or so coins I bid on. We finally made it back home and I looked over the auction results. I had lost 5 auctions, but somehow managed to win the coin I really wanted. I needed a proof restrike halfpenny for my SOHO collection and I figured I might as well pick up an odd one to fill the spot. This one is odd enough and fit within my budget!